Las Vegas (AFP) - At the Graceland Wedding Chapel in Las Vegas, an Elvis impersonator in a black jumpsuit croons as a couple walks down the aisle. Pastor Jean-Claude Chevalme pronounces them man and wife. All in 10 minutes flat. But the wedding business isn't what it used to be in Sin City. 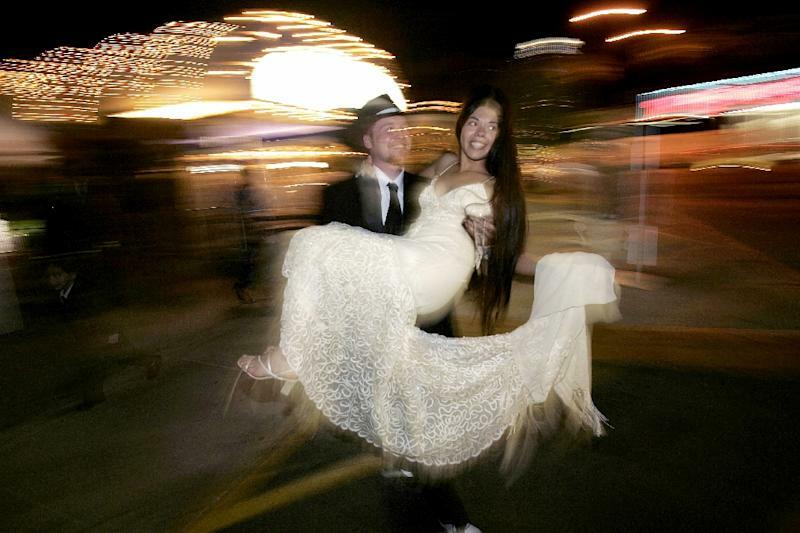 The US desert oasis known for all-night gambling, extravagant shows and no-hold-barred boozing has for decades also been a magnet for couples from around the world who are looking to tie the knot quickly and cheaply. The kitschier the ceremony, the better. The marriage license office in Nevada's Clark County is open until midnight every day, even on holidays. Weddings usually cost just a few hundred dollars. But fewer people are taking advantage of the southwestern city's flexible laws -- 37 percent fewer over the past decade, in fact, as the number of Vegas weddings dropped from 128,000 in 2004 to 81,000 last year. 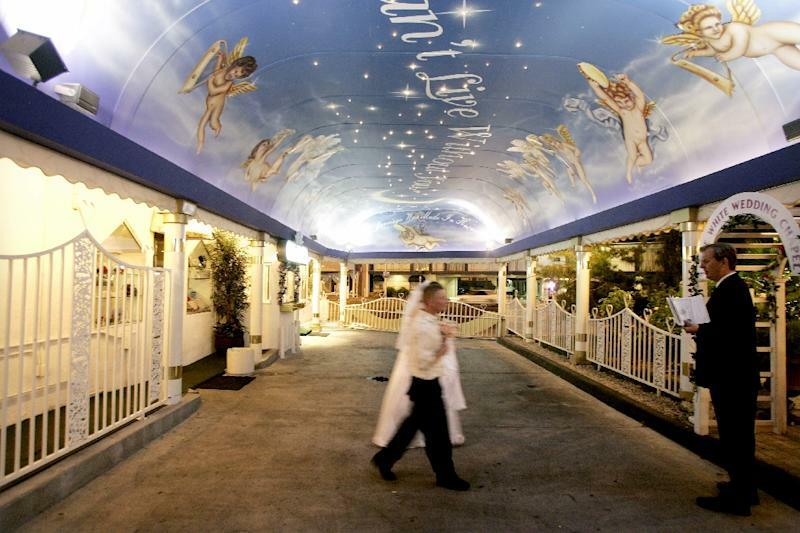 "The wedding business here in Las Vegas has fallen off since 2004. We haven't had ups and downs, and ups and downs -- it's just been a consistent drop every year," Chevalme said. "You know, people don't have as much money anymore because the economy here isn't that good." The downturn could also be due to a decline in the appeal of a style of wedding that emerged more than a half-century ago. "Paul Newman and Joanne Woodward got hitched here -- two big Hollywood stars of the 1950s," said Clark County clerk Lynn Marie Goya. They weren't the only ones. Mia Farrow and Frank Sinatra exchanged vows in Sin City in 1966. Demi Moore and Bruce Willis, Angelina Jolie and Billy Bob Thornton, and Richard Gere and Cindy Crawford all tied the knot here. The luster from those celebrity weddings has worn off over time as a Vegas marriage has come to mean something less glamorous: an impulsive, and usually ill-fated, marriage. Stars like Carmen Electra and Dennis Rodman got married there before annulling their vows nine days later. Britney Spears and Jason Alexander tied the knot -- and then promptly untied it 55 hours later. What happened in Vegas really did stay in Vegas. Films like "The Hangover" haven't helped the city's image. "One of the misconceptions over the past few years is that people only come here when they are drunk and they get married last-minute, and that's just not true. That makes great movies but that's just not true," says Goya. Even with the downturn, Las Vegas remains the top destination for weddings in the United States, and newly legalized gay marriage could provide a new source of revenue. But Las Vegas estimates the nearly 40 percent decline in weddings has cost the city $1 billion a year, so it is starting to fight back. It has kicked off a publicity campaign to restore the allure of the Vegas wedding and to attract a new generation of lovebirds to the city, especially from overseas. "It's all about the fun and the craziness. Everything is large, big, so different from what we have back in Norway," says one new bride. Rob Johnston, a newlywed from Britain, says he and wife Claire loved their Elvis-themed wedding.